They do say that until you don’t meet the worst the best is often not realised. It was a bit of a coincidence that almost all six of us on the trip were history and mythology enthusiasts. After a 6Km walk to the stone chariot we were tired, exhausted dehydrated and hustled. So what did we do? The first guide that came our way, we nodded our heads and hired him. For a huge sum of two hundred rupees, meet Santosh. Next day by a turn of fate and better planned days of the trip we changed our guide. What followed was a basic class in history where we were told things to the tune of “Hanuman’ being a devotee of Ram (exaggerated a bit, but not lot). And most of us were left wanting the good ol’ Santosh. I shall repeat. They do say that until you don’t meet the worst the best is often not realised. It took us a little over another set of twenty four hours to call back Santosh. 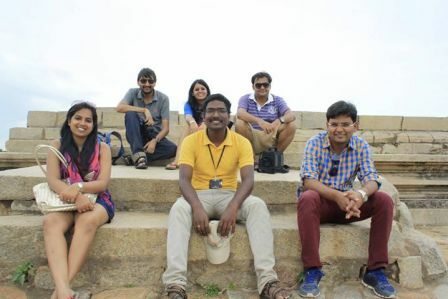 And there he was clad in a yellow t-shirt with Karnataka tourism print, a spunky pee-cap and his sprightly smile. And yet again we were enthralled by his in-depth knowledge of the monuments, dynasties and the little things that almost no other guide around was telling their tours. Almost all of us felt a chill run down our spine. Out of six four were engineers. “I studied in Karnataka University.And in my third year I dropped out and returned because I realised history is where my heart lay,” he continued. There was no change in his voice tone or expression but the same could not be said about us. We were surprised to say the least but also dwarfed. How many of us had the guts to do this? Such risk taking abilities are so rare today. After a lot of words of encouragement we moved ahead to reach another monument. And on our way we saw a huge group of tourists wearing Karnataka Tourism t-shirts. “You guys like them?” Santosh asked us. “I designed them. That picture is taken by me. 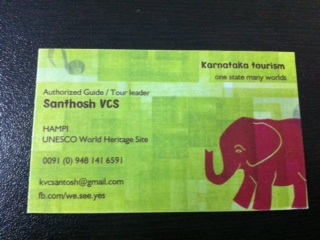 I got a lot of t-shirts printed for Hampi tourism and now they are sold all over the city,” he continued speaking. Stunned. Quiet. Again impressed and dwarfed. Us. He was everything we had silently wanted to be. A risk taker. A person who did what he wanted to be. An entrepreneur. A life enthusiast. “What next Santosh?” we asked. “Being a guide is my passion. Not the intended profession. I plan to move across Karnataka, study more of other cities’ history. 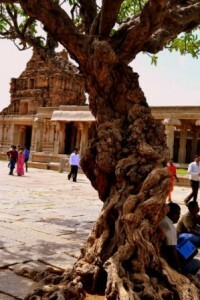 And in the end make something out of Karnataka tourism and history,” he replied with his characteristic smile. And suddenly that odd three hundred rupees we had given him on day one looked so small. So nothing. was too much for him. 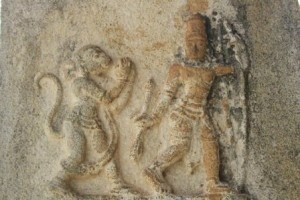 If you go visiting Hampi, you need to track him down. No not because of all that he has done (well perhaps that too! ), but because he is really good at what he does. Santosh followed his heart. U so right, how many of us are willing to do it? Santosh seems a very interesting person – following one’s passion is the most interesting thing one can do. @santosh you are truly an inspiration. Good luck dude, if you are reading it. And @richa, have you just transferred your blog from blogger to wordpress, because i am seeing some changes, or it was so and i have never noticed. Wow. Stumbled upon this post a little late. 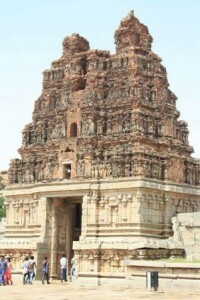 I visited Hampi a couple of months back. Loved the place.